You are looking at the Kershaw Northside Hunter knife model 1090GH. This knife makes an excellent choice to carry with you on those long hunting trips deep into the woods. The 4.5 inch stainless steel blade has an integrated gut hook and can easily cut through anything you place in its path. This makes it incredibly convenient to use when field dressing game for smooth cutting and getting the job done quickly. 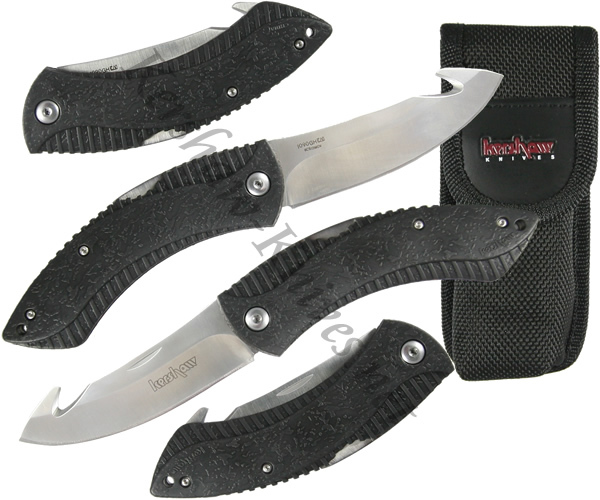 You will not even know your carrying the Northside Hunter knife on your trips because it only weighs 4.7 ounces! The small size of the Kershaw Northside Hunter creates the needed room for other important supplies you may be carrying with you. The black Santoprene injection molded handle prevents problems with gripping the handle while using it, even in wet conditions.